Celebrate chic. 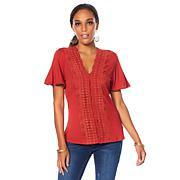 This embroidered top gives you unlimited style with every pairing. This top is so WIDE!!! Weird fit. Runs really big but runs short as well. I'm returning and may not order Labellum again. I ordered 3 pieces, this was one of the 3, and I had to return each one for different reasons. Waste of money due to return shipping costs resulting from poor quality control. ordered the grey in size large. the description said it is loose fitting and garment measurements said 47 in the bust. WAY TOO tight in the arms and I do not have big upper arms. Will be returning.